Over the past few years I have been reading a number of books on science communication. Leaving aside the “how to” genre, quite a few of these books have been academic examinations of science communication. Some aspects of this interest me, but at times it can become a bit too much fuss. It’s like when you are wanting a viewer’s review of a film, but find yourself facing an overly academic critic loading esoteric baggage on the director’s work. There are times you just want to step back from it from it all. By contrast, some works are more biographical, in that they try take the long, large view and put things in perspective through a narrative of sorts. Victorian Popularizers of Science caught my attention from a passing comment I read on another blog (I’ve long forgotten where) saying that it provided an interesting contrast of current issues in science communication with that of the period immediately after Darwin’s The Origin of the Species. Lightman’s book is a survey of the science popularizers of the day, exploring the emergence of science writing as a career, including non-scientist writers (many of them members of the clergy), women writers, scientists as writers, discussions over who should “own” science communication, as well as the religion-science issues of the day with the writers’ responses to them. His book touches on many other aspects that are interesting in the light of present-day issues, such as the contribution of the steam press and related technologies, which has a parallel of sorts with the WWW today in how it lowered the cost barrier to published writing, the various strategies and styles different writers tried to connect with their readership, and the practical issue of making a livelihood from science writing. 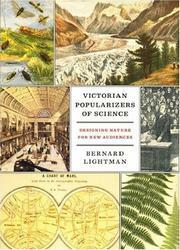 Victorian Popularizers of Science is a substantial work, released in hardback with 502 pages of text and a lengthy bibliography (30 pages) and an index. The acknowledgements open with “This book has taken over fifteen years to reach fruition”, and it shows. The care in it’s production is immediately evident, with amble references, citations, footnotes and an interesting choice of illustrations and cover. A minor quibble is that some of the illustrations lack full contrast and detail, being printed on conventional matte paper rather than high grade glossy paper as photographs and detailed illustrations most often are in textbooks. This will make the book more affordable and given there is such a thing as pricing yourself out of your market, it’s probably a wise choice. Printing the illustrations on paper does give the book a romantic “period” feel, reminiscent of fine woodcut illustrations. I dislike reviewing books until I have completed them as it’s impossible to put chapters in perspective with one-another and to have a sound feeling for the whole until you’ve finished. However, my opinion thus far is that this is an excellent book. Although sizeable, it can comfortably be read for interest. There are many interesting details and quotes that give a feel to the times and the issues of the people involved. Occasionally short passages have several references cited in-line; I personally would like to have seen the in-line reference citations moved to the footnotes to make the text a little easier on the person reading for interest rather than study. A short review can be found at the on-line version of the Times Higher Education Supplement. Despite the suspicion that a skeptic like me approaches the term ‘metapsychology’ (“speculation concerning mental processes and the mindbody relationship, beyond what can be studied experimentally”), the review at Metapsychology online reviews is a sound attempt to summarise the book. A more substantial–and drier–review is at academici, gives a chapter-by-chapter account of the contents of the book.